Quotable Liberty: What are your favorite quotes? 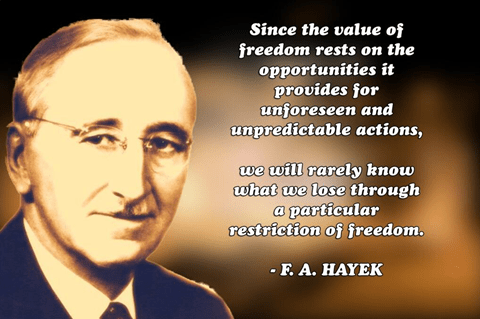 The Mises Institute has an entire page dedicated to Mises quotes at https://mises.org/quotes.aspx. It unfortunately feels rather impersonal and seems to be a giant collection of disparate paragraphs and sentences from his many texts. I was hoping to start a discussion to get a list of favorite quotes from the community. Quotes on liberty, politics, economics, or life in general that you add to debates or essays or simply quotes that help you get through the day. What are your favorites? I always liked this quotation mainly because it captures the idea of ‘opportunity cost’ and emphasizes why economic ‘plans’ from the top down are undesirable. Its impossible to know in advance which new ideas will be massive successes, therefore its impossible to plan such things. Unnecessary behavioral restraints cost us more than we can possibly know. And there you have it. Explaining why freedom is valuable, what ‘true’ freedom actually means, and why coercion is antithetical to said freedom. No one can tell, simply by looking at a number that is 100 million digits long, whether that number is subject to patent, copyright, or trade secret protection, or indeed whether it is “owned” by anyone at all. So the legal system we have – blessed as we are by its consequences if we are copyright teachers, Congressmen, Gucci-gulchers or Big Rupert himself – is compelled to treat indistinguishable things in unlike ways. Now, in my role as a legal historian concerned with the secular (that is, very long term) development of legal thought, I claim that legal regimes based on sharp but unpredictable distinctions among similar objects are radically unstable. Liberty is the soul’s right to breathe.